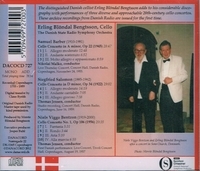 “This disc is one of a series devoted to cello virtuoso Erling Bloendal Bengtsson (b. 1932), a Copenhagen-born musician of distinction who trained with Gregor Piatigorsky and became his assistant, teaching at the Curtis Institute. This collection of three relatively modern cello concertos documents his long relationship with the Danish State Radio Symphony, a collaboration that began in 1947 with the music of Lalo. Here, in recordings 1955-1959, Bengtsson enjoys the musical expertise of Thomas Jensen and the gifted Nikolai Malko (1883-1961), for whom the Barber Concerto in a Minor (live, 24 November 1955) – in its first Scandinavian performance – adds a significant work to his discography. The Barber Concerto (1945) comes almost directly after the composer’s service with the Army Air Force. The piece had been commissioned by an amateur cellist, John Nicholas Brown of Providence, Rhode Island. Serge Koussevitzky premiered the concerto in Boston, 5 April 1946 with Raya Garbousova. The first movement’s angular but lyrical passagework, along with some fiendishly wide leaps, double stops, and harmonics, pose no difficulty for Bengtsson, who makes the cadenza sail with pungent authority. The bassoon work from the orchestra proves noteworthy, and Malko elicits an elastic, silken string tone from his Danish ensemble. The Andante sostenuto, in the manner of a melancholy siciliano, offers a lyrical song in ternary format that places woodwinds and plucked strings against the cello’s sighs. The last movement, Molto allegro e appassionato, projects muscular force by way of jagged motifs marked by half-step syncopations that lead to a secondary theme over an ostinato bass. A singular tension, driven and urgent, marks this progression, which builds into a visceral climax in rapid filigree for Bengtsson; after which development and recapitulation, rather truncated, take us to the coda in which the principals well revel in their respective prowess.